Arrive at Coolongatta Airport. Collect your hire car (group to arrange themselves) and drive to your accommodation. BreakFree Diamond Beach is a popular low rise resort set in expansive tropical gardens. 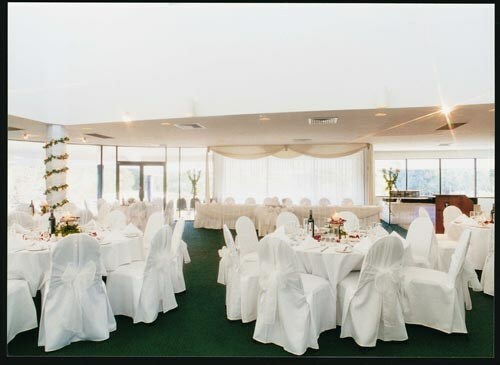 Located 100 metres from the Broadbeach beach, the resort is also close to Conrad Jupiters Casino and within walking distance to chic cafes and restaurants. Self-drive to Hope Island for morning golf game. Approx drive time is 35 mins. 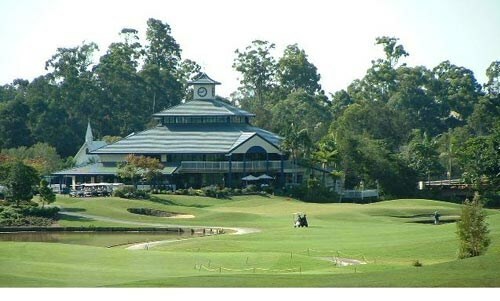 Self-drive to Brookwater for morning golf game. Approx drive time is 1 hour and 15 mins. 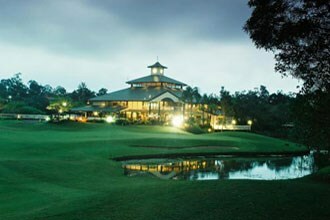 Brookwater Golf & Country Club is a spectacular Greg Norman-designed championship course. 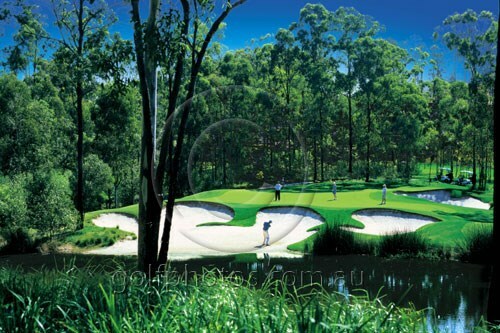 Meandering its way through naturally undulating Australian bushland, Brookwater bears the hallmarks of classic Norman design - signature bunkering, spectacular use of natural waterways and thoughtful integration of the existing flora. 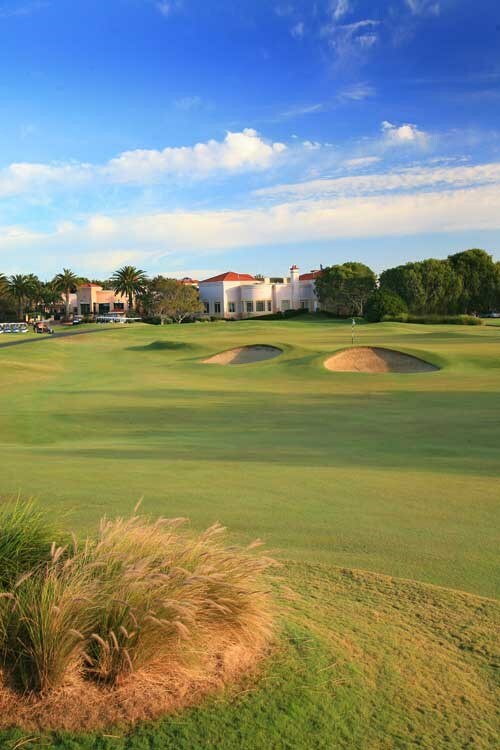 Its varied terrain, strategic design and landscaping makes it a course of outstanding character, great variety and a pleasure to play for golfers of all levels. Self-drive to The Glades for morning golf game. Approx drive time is 15 minutes. 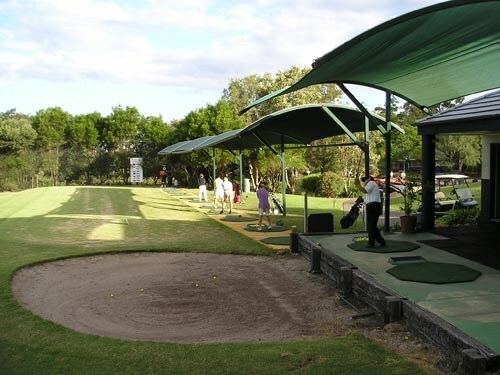 Self-drive to Robina Woods for morning golf game. Approx drive time is 15 minutes. Check out of your accommodation. Self-drive to Lakelands for morning golf game. Approx drive time is 15 minutes. Drive to Coolongatta Airport. Return your hire car and catch your flight home. 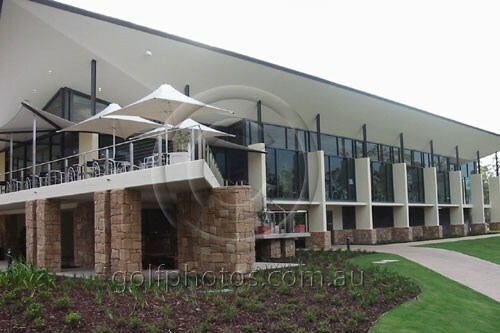 The centrepiece of the community, Brookwater is the first championship calibre golf course to be built in the Brisbane environs in nearly 30 years. The ambitious design weaves up and down rolling terrain encompassing two nine-hole loops and an overall distance of 6,505 metres. 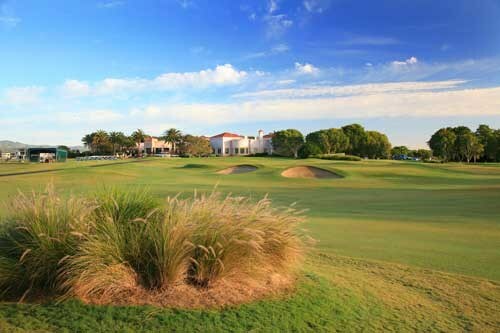 Its varied terrain, strategic design and landscaping makes it a course of outstanding character and the perfect environment for you to enjoy a day of premium golf. 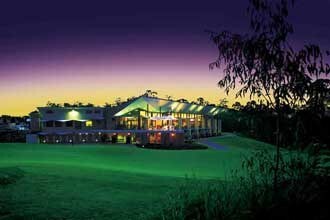 Brookwater Golf & Country Club is managed by Troon Golf, worldwide leaders in golf course management. Golf at Brookwater is more than a game - it's a unique experience, with Troon Golf's five-star approach to superior service - a total commitment to excellence, from the fairways to the clubhouse. Nestled in one of the most beautiful pockets of natural bushland in Queensland, Brookwater is a community in harmony with the environment. Imagine waking every morning to nothing more intrusive than the gentle sounds of nature. 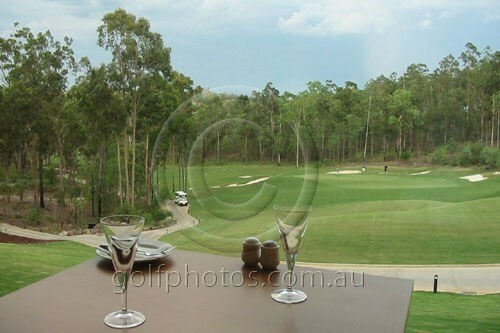 The warbling of native birds, the whisper of the breeze through trees that perfectly frame your view to a dew-covered emerald fairway sparkling in the sunlight. 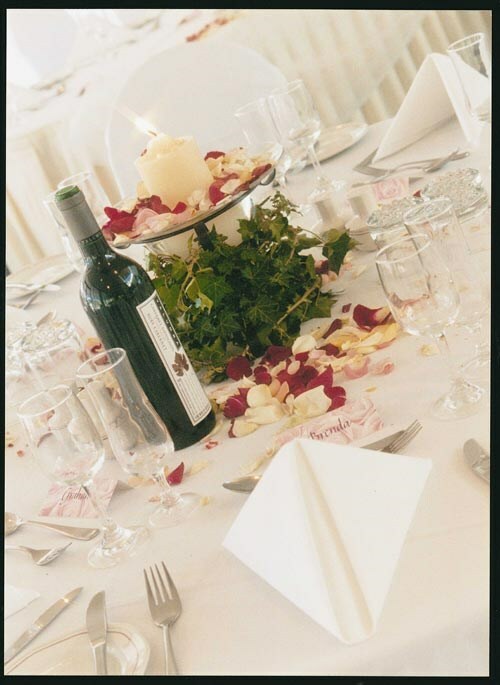 This is life at Brookwater. A challenging opening hole. A medium length par 4 into a valley with a gentle dog leg to the left. 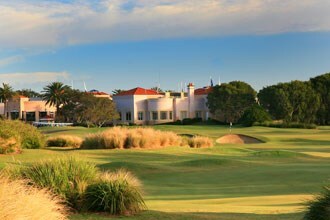 The tee shot should focus on accuracy with hazards and deep bunkers to the left of the fairway. After a good tee shot to the upside, centre-right of the fairway you will be left with a medium length approach to a well guarded, elevated green. The green is two-tiered and slopes from back to front. Tip - do not leave your approach shot short or the ball will funnel down into the valley a long way short of the green. A fairly long hole upa slight hill, but a very attractive one. The drive must be threaded between trees to a shallow undulating valley. From there the fairway swings to the left before curving back to the green and the right hand side of the hole is guarded by a wild gully and a group of very tall trees half way between the landing area and the green. These trees block the direct approach to the green from some parts of the fairway and largely determine the strategy of the hole. A long drive to the right enables a brave second across the wilderness area directly to the green. 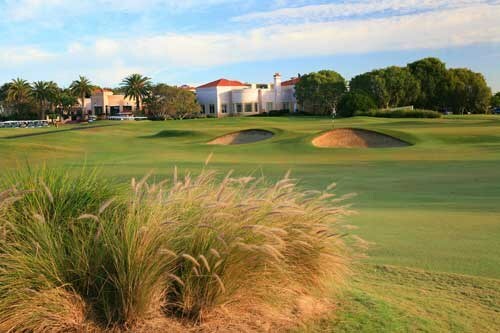 The safer second shot is to the left, from where the front half of the green is easily accessible but the back is guarded by a bunker on the left and the gully on the right. Very different to the 2nd, as the drive is played across a shallow valley uphill to a ridge, from where the fairway plunges steeply downhill before rising again to a green at about the same level as the landing area. The green is slanted from right to left and bunkered heavily on both sides, and favours a tee shot played long to the righ hand side. The whole hillside at the green is scattered with bunkers. As a result, the 2nd shot looks spectacular and shold be exciting to play. A very dramatic hole, but quite a difficult one. The tees are very elevated and the drive carries to a fairway in a shallow valley which curves from right to left around a number of fierce looking bunkers carved into the ridge on the direct line of a long drive. The bravest line is directly across these bunkers. At the foot of the hill there is a break in the fairway and the hole crosses a shallow gully before rising steeply up the hill to the right to a green which is best approached from the left side of the fairway. The beginning of the green is pitched steeply in the Augusta manner and the back right pinspot will be guarded by bunkers both front and back making it very difficult to reach. 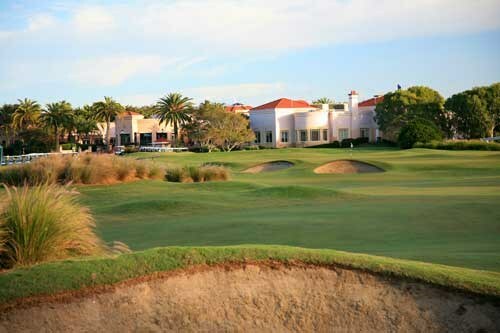 The bunkers on the front right are among the most dramatic on the course. 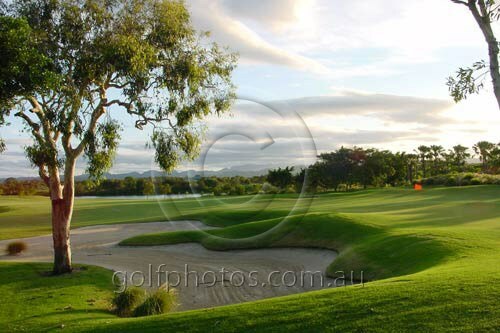 A medium length par 3 which is played steeply downhill from a series of tees set into the bush rock. The left side of the hole is flanked by natural bush and a steep gully. The easiest approach is from the right where the slope helps the ball onto the front of the green. The ridge which frames the right hand bunker extends into the green, making access to the back right pinspot very difficult if the tee shot is missed to the right. The difficulty of this hole very much depends on the pin location as the front right section of the green is easy to hit. There is a steep drop-off on the back left of the green and this is most definitely not the place to go. 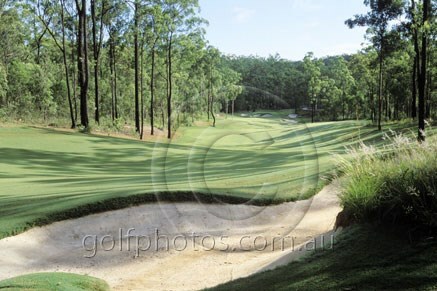 This beatiful par 4 is played slightly downhill in a steep raving, totally isolated in the natural bush. Just past the landing area the hole doglegs to the left around some large ironbarks and then swings to the right around the edge of a wetland which cuts diagonally across the front right of the green. The fairway then slopes down towards the green, making a running shot possible from this side and favouring a drive placed long and left on the fairway. A draw is the best tee shot and a fade the best approach. 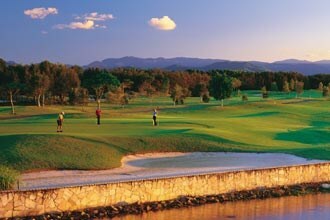 Possum Creek and the surrounding landscape forms the very picturesque backdrop to the green. A long 1-shot hole played a little uphill from a series of tees which curve to the right. 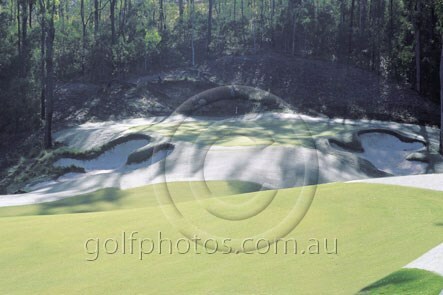 The green is angled from left ot right with deep bunkers along the right side. 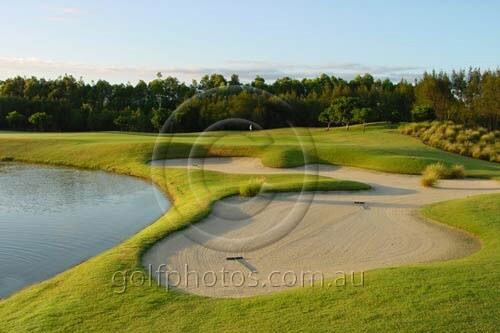 Another bunker is located 20 metres short of the green on the left, and the best approach to the green is across this bunker ? perhaps with a running shot. A grass swale runs the length of the green at the rear and gradually gets deeper towards the back right. Escape from this swale will be easy to some pin locations, but difficult to others because of the downhill slope in the green. One of the most appealing holes on the course, the 8th is a long uphill par 5 played through a very steep gorge. This fairway twists severely and continuously up the hole and the inside of many of the curves is guarded by large trees ? which makes the choice of both line and distance very important. The drive favours a draw played over the corner of a ridge on the left side and the 2nd favours a fade to the undulating landing area and a raised green guarded on the right by bunkers and a deep swale. This valley hole is atractive but narrow and is something of a survival test. A very short but demanding uphill par 4 played from tees set in the bottom of a steep slope. The drive crosses a small lake and plays severely uphill to a landing area which curves to left and is guarded by a series of bunkers along the left side. The hole looks frighteningly narrow from the tee, but opens up at about 150 metres, where the fairway becomes wide. The short second is played to a small green which slopes slightly away. 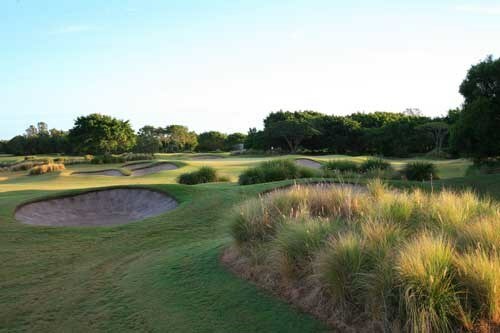 It is protected on the front and the left by bunkers and on the right by a ridge which extends into the green before rolling over into a hollow which gradually deepens along the right side of the green. Chipping from this hollow will be tricky because the green slopes away from it. 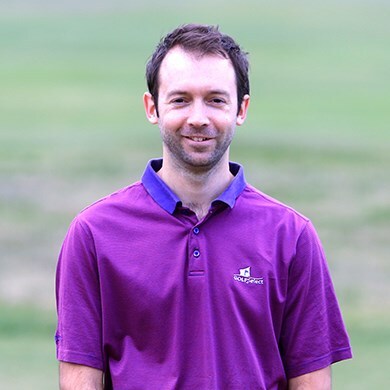 The best shots is probably a running one from the left side of the fairway which takes advantage of the slope to the right before curling onto the green. 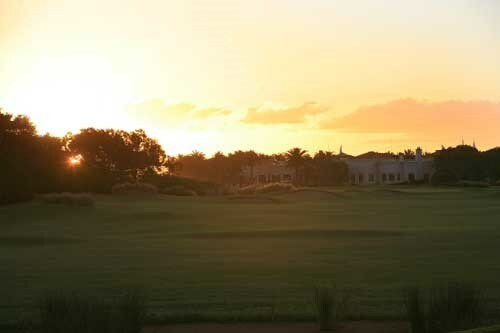 The green itself slopes from right to left and will be difficult to approach from the extreme right of the fairway ? from where it is partly blind. Another short par 4, this time from a slightly elevated tee to a valley, before sweeping steeply uphill to a green guarded on both sides by some of the most appealing bunkers which extend down the right side of the fairway towards the landing area. A very pretty hole where the difficulty lies largely in the narrowness of the second shot and the shape of the green, which is severely 2 tiered and requires an accurate shot to the back section. The 3rd shot par 4 in a row, but very different from 9 and 10. In this case the drive is played from elevated tees downhill and across a ridge to a fairway which then swings to the right and a little downhill to a green which is set into a lake and guarded on the front right by a wetland. 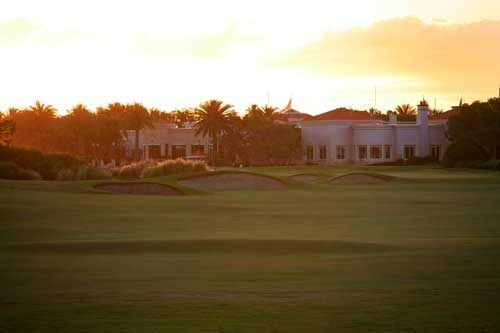 The right side of the fairway is dominated by a huge, wildly shaped bunker short of the landing area. 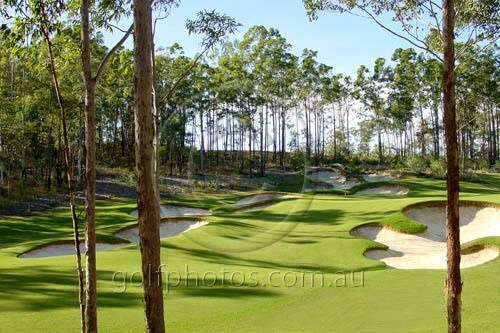 Once again the hole is played through a corridor of the natural bush and if the drive is played to far to the left the second shot is partly blocked, at least to some pinspots. The emphasis is on picking both correct distance and direction for the drive. The large green is also guarded on the left by a bunker which leads downhill to pinspots in the middle and back of the green making access to these very difficult from the bunker or the left side of the fairway. Another shorthole, this time steeply uphill for the entire length of the hole and a slight dogleg to the left. A series of fairway bunkers to the right and a rolling fairway favour a long drive to the right to get the best line of approach to a green which is severely bunkered on the front left. The green is also undulating and the back pinspots are difficult to get to. The right hand side is guarded by rolling hollows which form part of the fairway. A very long par 5 but steeply downhill and will not play as long as it?s measured length. It?s also one of the prettiest holes on the course and a very interesting one. The elevated tee shot is played to a very narrow fairway in a steep gully which rolls and twists and effectively separates drives at differenct lengths. 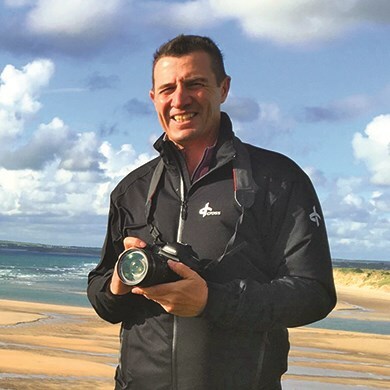 The corner of the dogleg is guarded on the right side by a bunker and once the fairway turns to the left it sweeps steeply downhill over a wildly shaped fairway to a green set in the side of the ridge and guarded by a sweries of bunkers leading in for the last 50-60 metres. The green is very small and must not be missed left into the deep bunkers.The right side of the green slopes upwards and can be used to run balls back onto the green. 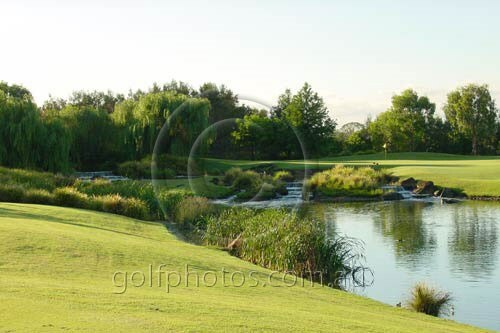 This hole is played across a natural watercourse to a green in a ridge which is slanted from right to left and is guarded on both sides by bunkers. The surface of the green is quite undulating and the back pinspot and middle left pinspot will be difficult to reach, while those on the right hand side will be considerably easier. The hole is surrounded by attractive bush which forms part of the natural floodway and will not be disturbed. 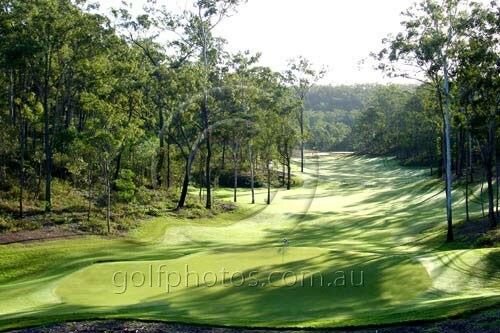 This is a very appealing hole played along Possum Creek adjacent to the National Park and once again surrounded by natural bushland. 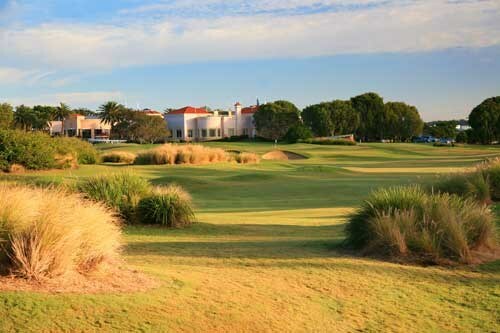 In some ways it offers relief from the previous holes because the fairway is very wide. However the hole doglegs sharply to the right and the drive is best played as long and close to the right side as possible. 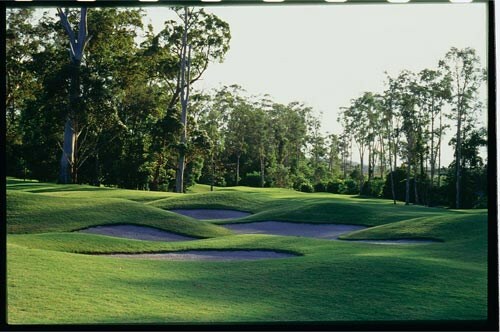 The green is set at the foot of a slope of natural bush and hard against Possum Creek, making it an attractive but difficult target unless the drive has been played long and right. A short drive to the left leaves a semi ? blind shot to the green. 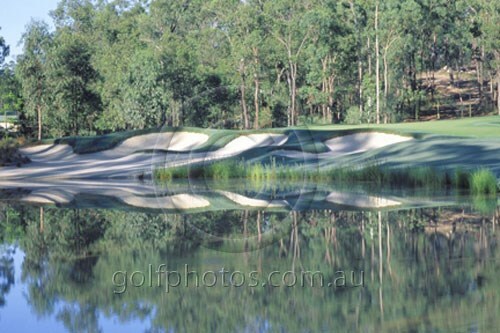 The trees at the 16th are located in the bush adjacent to the creek and the hole is played across the corner of a wetland to a green perched on a slight hill and slanted from front left to back right. 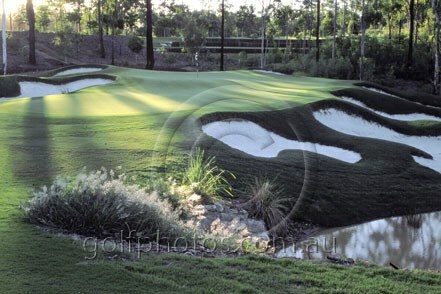 The left side of the green is guarded by fierce looking bunkers which disappear into the wetland and the green rolls uphill to the right, with the front right being protected by another fierce bunker. A very large and moderately undulating green completes the picture. This reachable par 5 begins with a demanding uphill drive through a narrow opening in the forest from trees located on the edge of a creek. A roll in the fairway sweeps steeply uphill at the length of a good drive, and the landing area is bunkered short on the right and long on the left. 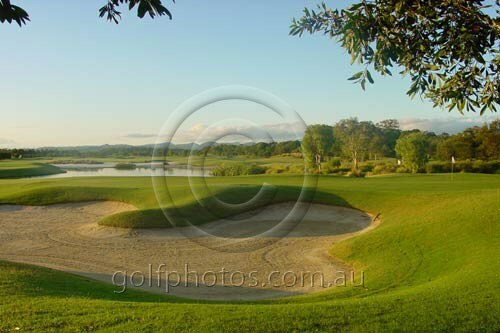 The hole then falls slightly downhill to a green located in a natural amphitheatre and framed on the right by a wetland and a series of bunkers which rise from the wetland to the edge of the green. An accurate long term drive creates the chance to go for the green in 2, but the second is a risky shot. The lay-up short is relatively easy to a wide fairway. An interesting par 4 which sweeps uphill to the left and will play longer than its measured length because of the slope. The drive is played across a gully and an undulalting fairway to a large bunker on the right corner of the landing area before sweeping uphill to a wildly undulating green protected by a large number of traumatic bunkers. 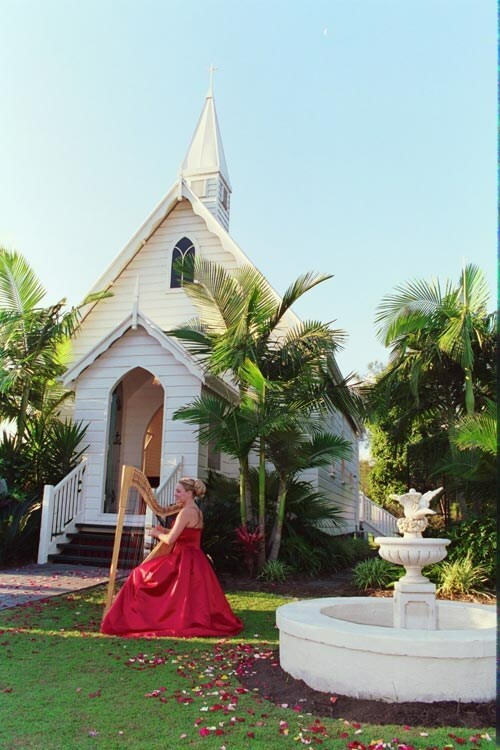 These are placed partly to dictate the difficulty of the shot and partly for dramatic effect. 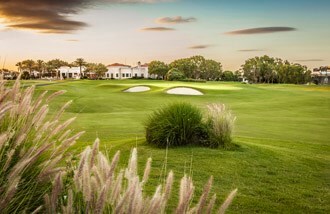 All of the useable pinspots on the green are on the left adjacent to the bunkers, while the right side is undulating and sweeps downhill to the fairway. It?s best to miss to the right but the chipping from this area will be particulary delicate. Demanding shots all round on the finishing hole. Qi Resort and sap presents 80 levels of luxury 1,2 and 3 bedroom apartment accomodation, with unparalleded resort facilities, centrally located in beachside Surfers Paradise. 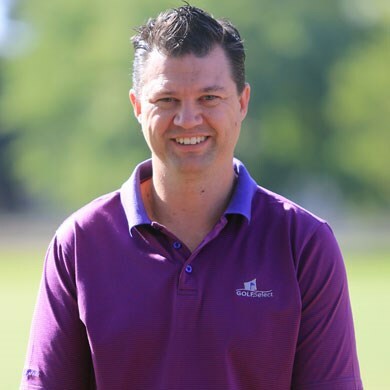 The Wave is centrally located to all the major Broadbeach attractions including the Broadbeach Mall, Oasis Shopping Centre, The Gold Coast Convention Centre and Conrad Jupiters Casino.